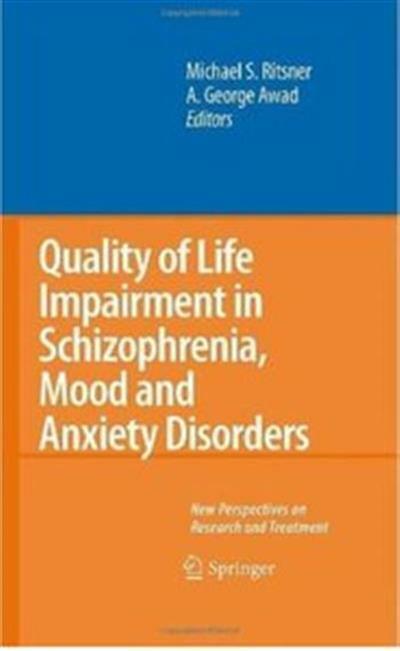 Quality of Life Impairment in Schizophrenia, Mood and Anxiety Disorders: New Perspectives on Research and Treatment | Free eBooks Download - EBOOKEE! Posted on 2013-05-02, by ebooksfree. A fascinating and worthy text that presents new insights into a hugely important area of mental health. Health-related quality of life (HRQL) impairment is a core domain of prevalent mental disorders such as schizophrenia, schizoaffective, mood and anxiety disorders. The authors present a new conceptual framework for this field by explaining how HRQL impairment arises from interactions between various multidimensional factors. They suggest several ways in which further research could enhance our understanding of HRQL impairment, its biological basis, and its relevance to psychopathology. 2011-10-11Michael S. Ritsner, "Brain Protection in Schizophrenia, Mood and Cognitive Disorders"
No comments for "Quality of Life Impairment in Schizophrenia, Mood and Anxiety Disorders: New Perspectives on Research and Treatment".